The floating offshore wind turbine Floatgen was tugged to its permanent offshore installation site – the SEM-REV test site – during the night of April 30th. 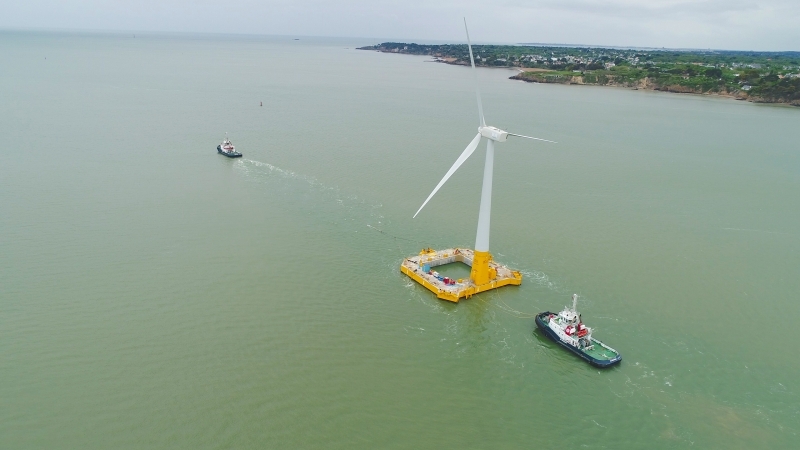 France’s first offshore wind turbine arrived on the Ecole Centrale de Nantes’ offshore test site, 20 km off the town of Le Croisic, on Monday April 30th after ten hours of towing. Hundreds of gawkers lined up the harbour and the beaches of Saint-Nazaire to watch this unique convoy go by. These towing and hook-up operations symbolize the beginning of a new era in the life of this internationally acclaimed project. The hook-up to the mooring lines which had been pre-laid in July 2017 was successfully executed by JIFMAR in the ensuing days. An episode of severe weather right after the floater’s installation (5m waves and 15 m/s winds) proved its excellent seakeeping performance and confirmed the accuracy of Ideol’s simulation models. The connection to the export cable and to the power grid will be scheduled in the very near future after a last series of tests.